We have said that when our daughter Frietzen arrives here, we would take a day and drive to Shelburne, close to the SW tip of the “south shore” of Nova Scotia. Frietzen arrived this week on Wednesday. She came from Calgary, where she is a student at the University of Calgary. She has a job in the German Bakery in Annapolis Royal for the summer. Actually she already worked for most of the day yesterday. At home here we have worked outdoors the last several weeks, because there is so much to do. But yesterday it rained a lot, and today everything is still soaked, and its a Saturday, so we decided to go for a drive. Going south from Annapolis Royal on Highway 8, we went through Lequille, and then under the highway 101, which goes westerly to Yarmouth, or easterly to Halifax. 50 kms south of Annapolis Royal is Kejimkujik National Park. We were there in February, and it is beautiful. We went all the way to the south shore and came to Liverpool. It is not very big. The Mersey river flows through there, and empties out into the Atlantic Ocean. It is very scenic. We traveled west on highway 3 and saw the ocean at Hunts Point. We love the water. Next we got off the highway at Port Joli, and drove about 10 kms to Kejimkujik National Park Seaside. We hiked about 2.5 to the ocean’s edge. It was beautiful. The sign said that seals are often sighted there, but we saw none. 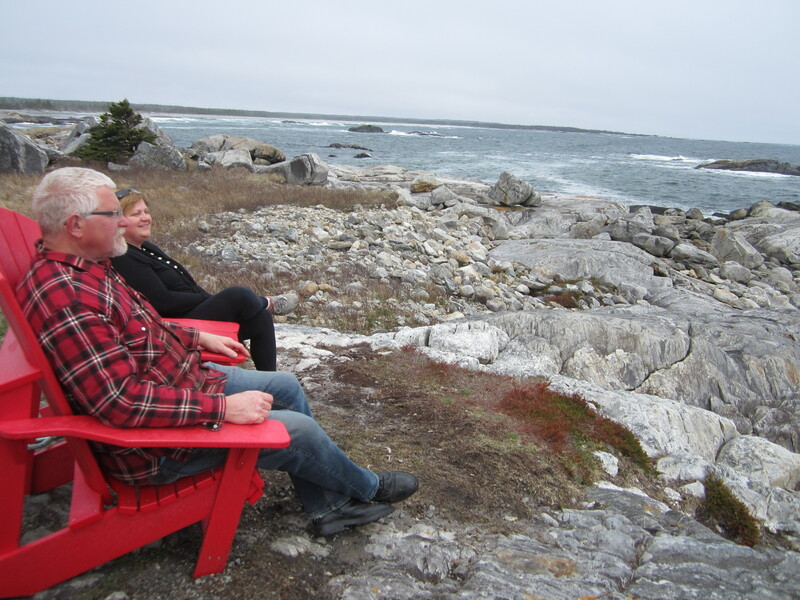 There were two red Adirondack chairs (signature of National Parks Canada) by the shore. So we sat in them, and enjoyed the view. From there we went to Shelburne, founded by British Empire Loyalists, British Americans in 1783. They were British Americans who disagreed with the revolutionary war. Shelburne used to be a centre for ship building, and is now an historic and scenic town. After a pricey lunch, we drove around a bit, and then headed home.